Police warning letters sent to three British schoolgirls who fled to Syria may have prompted them to join the Islamic State (IS, formerly ISIS/ISIL), a lawyer for the families has told MPs. Solicitor Tasnime Akunjee said the letters, which encouraged the girls to “rat on” their friends, could have triggered their departure. After their school friend went to Syria last December, the Metropolitan Police interviewed the girls at school as potential witnesses and gave them warning letters. Relatives of the girls told MPs of their anger at police for giving the letters directly to the girls, rather than to their parents. 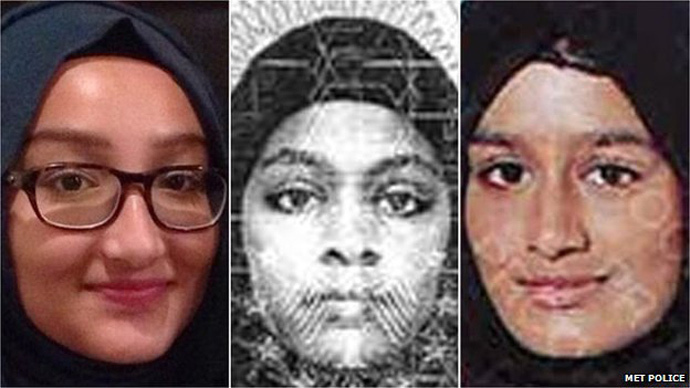 The girls – Shamima Begum, 15, Amira Abase, 15, and Kadiza Sultana, 16 – from Bethnal Green Academy disappeared after boarding a plane from Gatwick airport to Turkey on February 17. Speaking before the Home Affairs Select Committee, Akunjee said the families were considering the possibility that letters sent by the police may have prompted them to step up their plans, or create them in the first place. Amira Abase’s father told MPs he believed it was wrong to send such an intimidating letter to the girls. “I strongly disagree that the letter should be given to 15-year-old young girls because the word police by itself, terrorism, counter-terrorism...is a heavy burden. We feel that we, as a parent, have been neglected,” he said. “The letter terrified my daughter,” he added. The families of the girls also complained to MPs that the letter was not sent to them. Sahima Begum, sister of Shamima Begum, said her family was “never given the opportunity” to do anything. She said her family would have done more to monitor Shamima had they read the letter. Police have come under fire for allowing the girls to leave the country, despite one of them communicating via Twitter with a known Islamic State fighter whose account was being monitored by MI5. Families of the girls discovered a written checklist in a bedroom of one of the girls, highlighting the price of their plane tickets to Turkey, a total cost exceeding £1,000. The list, seen by the Guardian, also itemizes a phone at £75, underwear at £12, socks at £4, and other items such as makeup and boots. It also appears to feature two sets of handwriting, and has one of the girls’ first initials beside each item. The items on the list add up to £2,190. Metropolitan Police Assistant Commissioner Mark Rowley told MPs the girls may have sold family jewelry to pay for the trip.